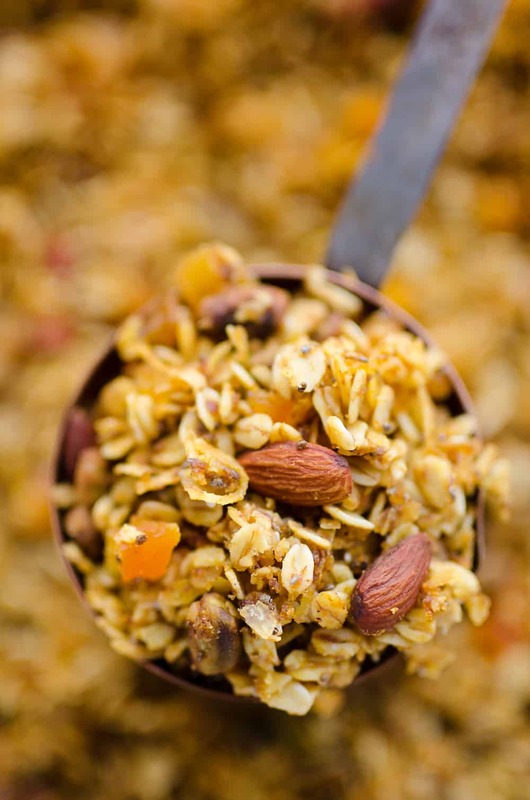 Pumpkin Coconut Granola is a healthy homemade snack recipe with delicious fall flavors. 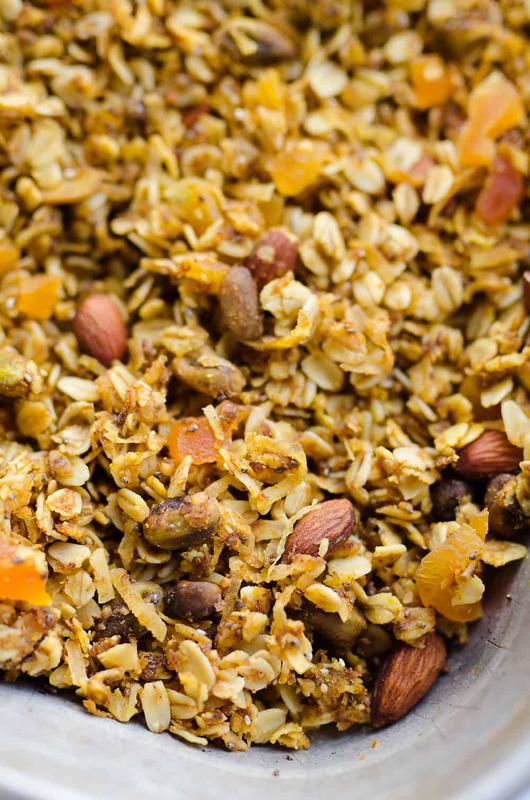 This crunchy mix is loaded with almonds, pistachios, dried apricots and so much more! 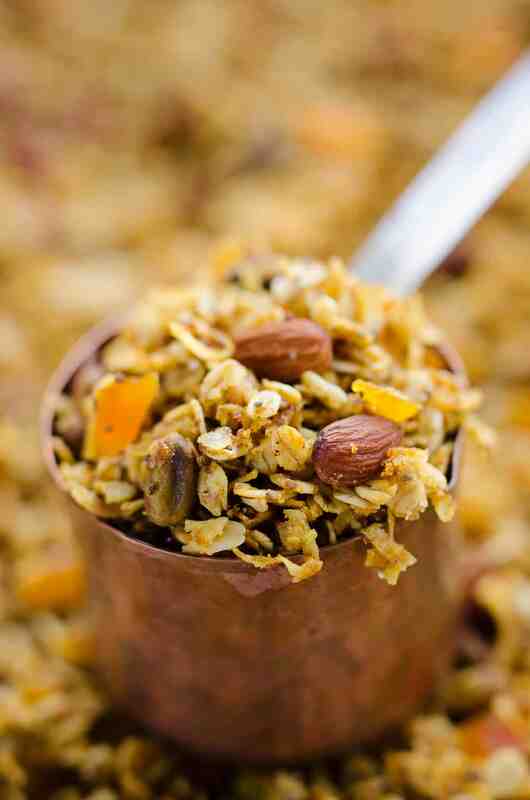 You can’t beat a homemade granola and this Pumpkin Coconut Granola is no exception. There is nothing better than knowing exactly in to what you are eating, which is why homemade is so fantastic. Not to mention you can completely customize it to your needs and wants. 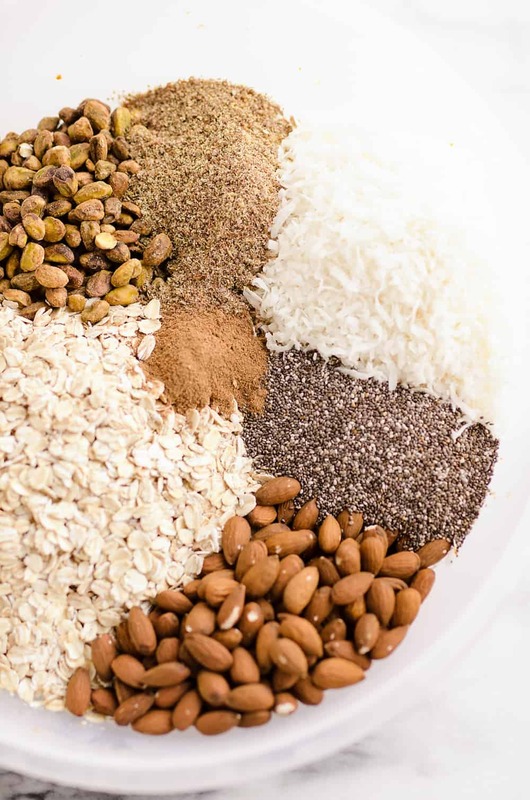 For instance, you can add in the flaxseed and chia seeds to this granola for added health benefits, or choose to leave them out if they aren’t readily in your pantry. Coconut seems to be one of those flavors that people either love or hate. I am obviously on the love side of things. From Coconut Strawberry Smoothies to Light Coconut Shrimp Quinoa Skillet, I really enjoy the bright flavor that coconut adds to any recipe, whether it is a sweet treat or savory entree. I loaded in all the good stuff for this Pumpkin Coconut Granola. From pistachios and whole almonds, to dried apricots and vanilla, it has a variety of flavors and textures that meld together wonderfully. You can’t forget the most obvious of flavors, coconut and pumpkin, which comes from pumpkin puree and pumpkin spice for the perfect seasonal touch. This Pumpkin Coconut Granola takes a little while to bake out the moisture from the pumpkin and honey, but it is well worth the wait. 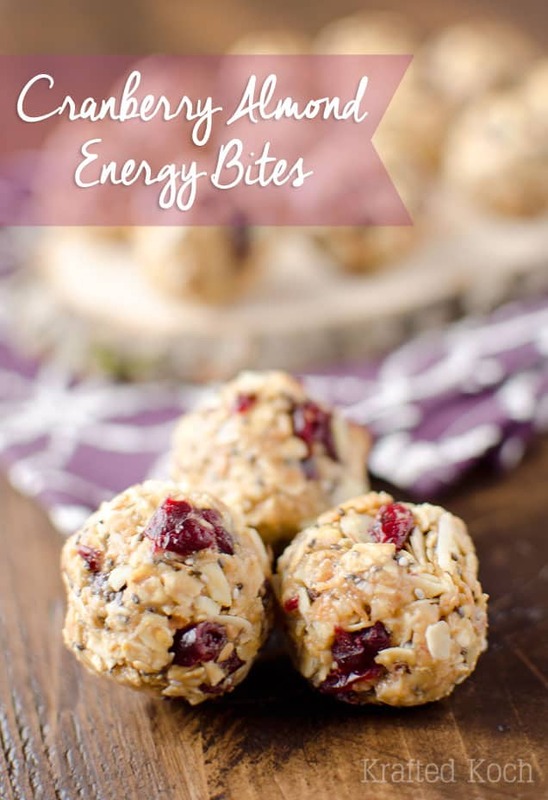 It makes a really big batch so it is perfect for sharing with friends and coworkers or gifting during the holidays. Who needs a big bag of candy for Halloween when you could get a container of this goodness?! 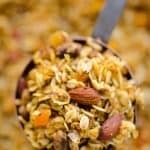 Pumpkin Coconut Granola is a healthy homemade snack with delicious fall flavors. 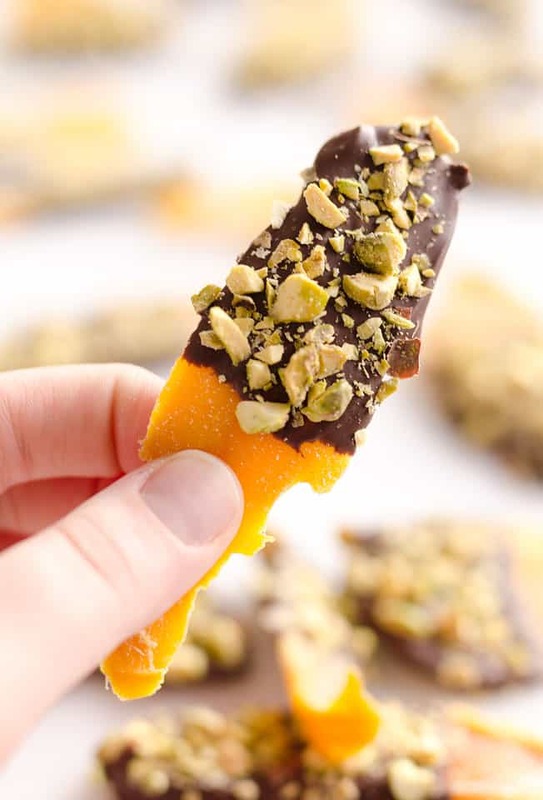 This crunchy mix is loaded with almonds, pistachios, dried apricots and so much more! In a very large mixing bowl, combine the melted coconut oil, pumpkin puree, honey, vanilla and sea salt until well combined. Toss the remaining ingredients, except the dried apricots, in the bowl and mix until everything is well coated. Spread the mixture over two separate cookie sheets. Bake at 350° for 15 minutes. Stir the mixture and bake an additional 15 minutes. If the mixture is still moist, bake an additional 5-10 minutes. Mix in the dried apricots and spread the baked mixture over wax paper on your countertop. Allow to cool to room temperature. Store in an airtight container. I love homemade granola, it’s so addicting!!! I didn’t care for coconut as a kid but I love it now! What a perfect combination of flavors! Homemade granola is such a great snack!! Love this! WOW!. Look at the wonderful combination. We are driving down to Florida. I am making this for my family to snack on. 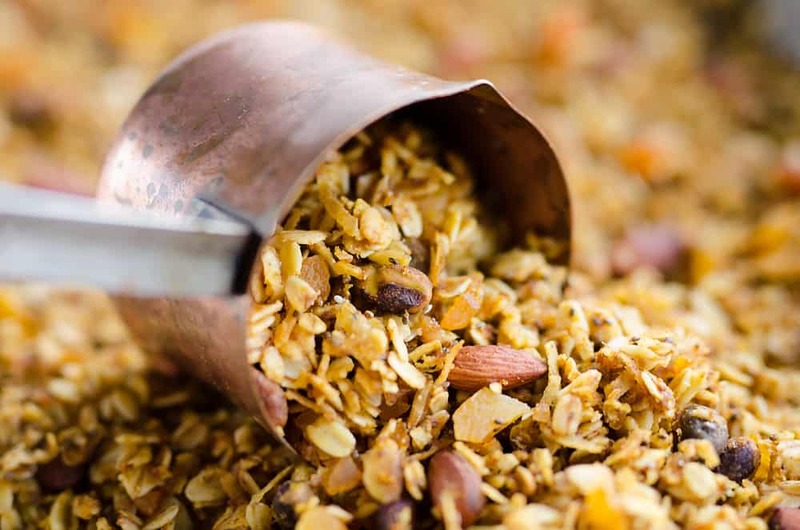 This recipe for granola sounds divine! I love the addition of the apricot! Nice recipe. Granolas are my all time favorite. I have never tried pumpkin in it but your recipe looks so tempting so this time I would like to add pumpkin to it. Keep sharing such yummy recipes.